Van Django’s music is well-rooted in the gypsy jazz of 1930’s Paris France, but beyond that it’s all pure blue-skying; flights of dazzling fancy, driving rhythms and boundless creativity, featuring original compositions and arrangements including humorous mash-ups wearing their eclectic influences in full regalia. Since the group’s formation in 1998, they have toured extensively in Canada as well as international forays to the US, Europe and China. 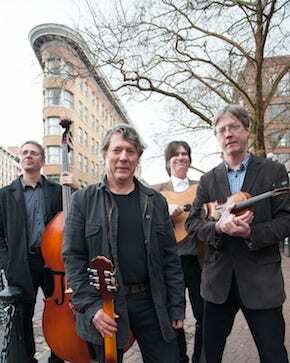 The group has had repeat performances at Djangofest Northwest (DFNW) in 2008-2016 sharing the stage with gypsy jazz luminaries such as the John Jorgenson Quintet, the legendary gypsy jazz guitarist Romane. They have also been featured every year in the Vancouver Gypsy Jazz Festival "April in Paris" since it’s inception 10 years ago. Van Django have released 4 CD’s, "Tiptoe Trip", "Waltz in the Shape of a Tree", "Hotel Europe" and a Christmas CD with special guests titled, "Cool Yule". Their CD’s have been well received and played on many radio stations including; CBC, RDI, Espace Musique, NPR and Lyric FM in Ireland CD. "Van Django tosses off jaw-dropping technical licks with effortless ease, but above all, they entertain hugely, with every bar of every tune â€” tried and true or keenly original." "Van Django can deliver acoustic power chords with the lustrous tone of a classical string ensemble while staying fully stoked on the spirit of the Quintette of the Hot Club of France." Cameron currently resides in Vancouver and is a member of the classical crossover piano trio JOE TRIO, the HARD RUBBER ORCHESTRA and Francophone inspired trio PASTICHE. His compositions and arrangements have been performed by numerous symphony orchestras and ensembles across North America. He has collaborated with CBC storyteller Stuart Mclean on â€œA History of Canadaâ€� and â€œI Remember Wayneâ€� and has recently co-written a film noir opera called â€œSupernatural Noirâ€� with playwrite Kico Gonzalez Risso. Both were released as a CD last year. Most recently he composed the music for the NFB film “Citizen Sam”. The music was nominated for a 2007 Leo award for best music in a documentary film. Budge has worked with a stellar cast of diverse artists including; play-write Thompson Highway, Ache Brazil, Denis Chang, Coco Trevisano, Jesse Zubot, Sal Ferreras, John Korsrud, Olam, Jennifer Scott, Leora Cashe,â€œChor Leoni Mens Choirâ€�, the Budge Schachte Quartet/Trio as well as numerous symphony orchestras shows with Tango Paradiso, and 2013 with the VSO playing John Adams' "El Nino"... He appears on several Hollywood film soundtracks as well as composing, performing and recording his first feature film soundtrack for the film, â€œLove And Other Dilemmas..
Brent has been a Vancouver based professional musician and teacher for nearly twenty years. In that time heâ€™s worked with; the Hard Rubber Orchestra, Gypsalero, Rumba Calzada, John Reischman, the Vince Mai Project, Jesse Zubot, Dal Richards, Lee Aaron and Dee Daniels. He has toured North America and Europe extensively. Brent can be heard on recordings by Oscar Lopez, Gypsalero, Juno nominees Susan Crowe and Compadres, Juno winner James Keelaghan, and others. Finn is a versatile and passionate musician with a Music degree from UBC and a penchant for playing anything and everything, whether on guitar or cello. He plays Swing and New Music, Bach to Bacharach, Surf and other worldly sounds. He can be heard playing live and on CD with: the Armadillo String Quartet, Ensemble Symposium, the Jazzmanian Devils, Soul Crib, the Paperboys, Denzel Sinclair, 54/40, Murray McLauglin, Mae Moore and Cam Wilsonâ€™s varying orchestral extravanganzas.